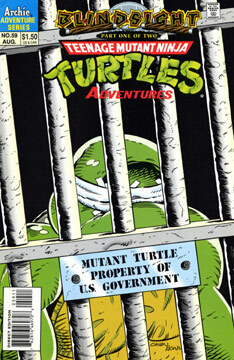 Tabloid TV reporter McIntyre attempts to use his show “Inside Affair” to cast the TMNT in a very negative light to the American public. McIntyre describes the Turtles as violent monsters and he has April on the show to discuss his accusations. The treacherous TV reporter twists April’s words to make the TMNT seem like a menace, but April has her own trick prepared – Oyuki goes into the control room and seduces Squint, the show’s producer. While Squint is preoccupied with Oyuki, she slips a video tape into the deck which is broadcast over the air and portrays how the U.S. government had tortured Mikey to get information while they had him in custody on the Coast Guard ship. The video also shows how Leo and Don were able to rescue their brother, and how Mikey, despite all that he’d been through, saved the life of the doctor who tortured him. The audience reacts wildly in favor of the the Turtles and applauds their heroics. McIntyre is steamed and vows to get even with April as the Turtles are greeted by multitudes of fans on the streets of New York City.